St. Patrick’s Day parties often get reputations for being epic. On the day of Irish pride, inhibitions are thrown out the window in favour of a good time. As much fun as St. Patrick’s Day parties can be, you will not only be left with a St. Patrick’s Day hangover, you will also pave the way for cavities to set up shop on your teeth. Tooth decay is a big problem related to alcohol consumption because of the sugars and acids in alcoholic drinks. When these sugars combine with natural bacteria in the mouth they form an acid that attacks enamel, breaking it down. This is especially true when the teeth are constantly exposed to sugars and starches in alcohol without a break. But it is not just the sugar and starches in alcohol that can be harmful to teeth. Alcohol dries out your mouth just like smoking does. Saliva is a powerful tool in reducing the incidence of cavities. Dry mouth can accelerate the damage caused by the sugar in alcohol. So be warned. 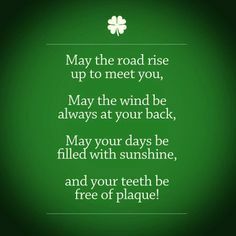 If you are going to partake in St. Patrick’s Day shenanigans, brush and floss your teeth as soon as possible! For those that are heavy drinkers and plan on a weeklong St. Patrick’s Day bender, the probability of damage from drinking is much higher. Heavy drinkers are also at greater risk of developing cancer in the mouth, throat and oesophagus. Obviously these are side effects that you want to avoid so if you are going out this week, take it easy. Your teeth will thank you! A Gripping Blog A Fabulous Day Out!